How the mighty have fallen indeed. I will confess immediately that I have never experienced the appeal that many have succumbed to when listening to this band, but back then, I assumed it was just a matter of taste. Now, about a 100 reviews into this blog (yeah!!11! ), I believe it cannot be a matter of taste. Whilst the band's previous outputs were relatively harmless, with what pop-rock sensibility and hooks they had, the latest self-titled is a serious test of patience and tolerance. At least they had a punk-ish vibe that suggested youthfulness back then, the latest output is plastic and soul-less. That is hideous make-up. The soul-less look would foreshadow the lack of music in this album. The lead single 'Now' is a serious cause for concern and showed the band aggressively pushing towards a mainstream pop sound, and the chorus 'Now-ah-ah-ah-ah-ah-ah-ahhhh' with its overproduced vocals and autotune is a far cry from the once more respected female vocalists in the pop-rock realm (yeah there are tons more better female vocalist than her). The departure of Josh and Zac Farro and their seemingly dubious message about Paramore now being 'a manufactured product of a major-label' is instantly felt in the album. Songs move in and out in vapid fashion, with no song actually taking up your memory after it has finished. Hooks are mostly absent. The influence of multi-instrumentalist Ilan Rubin on drums may have given the band the dangerous confidence to play styles which they cannot exactly pin down. 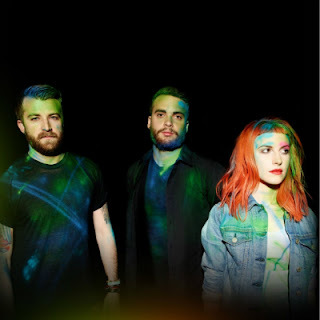 Yes it is a mixed bag, but a bunch of good songs played earnestly is always a lot better than a plethora of styles which are not within your grasp, as Heyley William demonstrates on this album, with either underwhelming dull vocals or over the top autotune on songs like the lead single, the gospel breakdown of 'Ain't It Fun' (and its cringeworthy lyrics "Don’t go cryin’ to yo’ mama, ‘cuz yo’ on yo’ own in the real world"), the sleep-inducing, aptly titled 'Daydreaming'... in fact nearly every song is a disastrous Katy Perry imitation. Add to this boredom the inclusion of three segues literally called 'Interlude...'. Why do you need three interludes for a pop rock album? All three have hints of gospel with Hayley spewing forth unmemorable lyrics over a barely audible banjo, cheesy as hell, with the worst being the last, titled 'I'm Not Angry Anymore', and its lyrics are literally just that for almost a minute. Why would a commercial band attempt anything this stupid? Interludes work extremely well when well written and integrated- listen to Korn's 1999 album Issues, it is rife with eerie psychotic rhythms and transitory vocals and really bridge the songs as well as create a tense atmosphere. I do not know what is the downfall of this band, whether they are trying the 'experimental' route since that is the 'cool' thing to do nowadays, or if its the departure of the Farro brothers, or whatever it is. Commercial critics are lavishing praise upon this album blindly, seeing that most of them are musically illiterate and have little exposure to underground music anyways. If you loved Paramore before, be wary, this album may make you reconsider your feelings for the band. If you were never a fan, congratulations! 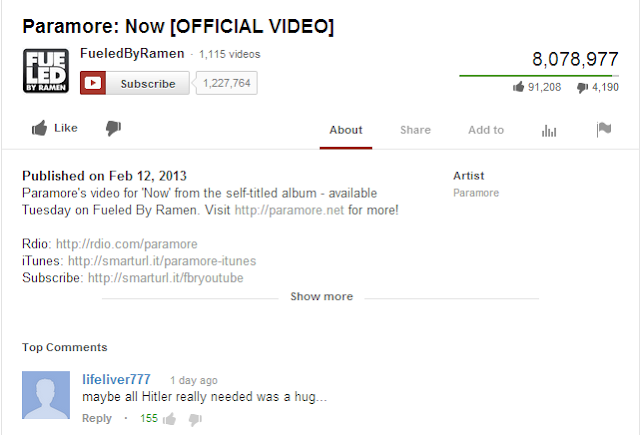 Here is another reason to stay away from this band.